Enjoy the amazing desert on a desert ride in dubai! On a Dirt Bike desert ride Dubai is the most fun of all, 40 horsepower and about 100Kg is the best toy in the desert. First of all you need to learn some skills riding in sand with this bikes. But with our professionell coaches at the MX-Academy, you will quickly master all desert ride technics for a proper desert ride in Dubai. But this technics are a must have entering the desert in Dubai for a desert ride. If you dont have the riding technics you need, it can be dangerous and you will struggle in the big dunes and deep sand. MX-Academy can offer you the most fun and fastest way to master the desert riding technics that are indispensable for the desert. Desert ride Dubai: You will have one of the best and most experienced desert riders as your tour guide. Mohammed Balooshi will show you how to master the desert. He will teach you to read the desert, find the best paths, bash dunes, ride dunes, jump and lots of other tricks. Mohammed Balooshi is born in Dubai an multiple UAE and Arab Motocross Champion. He is passionate with the motocross sport since 15 years and he is still exploring the dunes around Dubai with his bike on a desert ride as much as he can. In order to join one of our enduro desert riding courses, you will need a basic level of dirt bike or enduro skills in the sand. We suggest that you spend at least one or two days at our MX-Academy with Motocross training before you enter the desert for a desert ride. Before we start our desert ride, participants will be divided into groups. Depending on your skills and physical shape, the training will last some hours up to a whole day. A must-do for all motorcycle fans when in Dubai is a desert ride in Dubai! Close to Dubai the desert is quite flat. 20 km East of Dubai the desert begins to get a look like the open sea. It starts with smaller sand dunes to finish up to 300 m high at Liwa Sands 150 km Southeast of Dubai in the Emirate of Abu Dhabi. The desert changes almost every day. The sand dunes wandering around. To ride a motocross bike can be very tricky without knowlodge about the form of sand dunes like the top and valleys of a sand dune. The first time I have been in the UAE desert I thought, it is only sand! Nothing around but sand dunes. This is so boring especially when it comes to motocross riding in the desert. Back in Europe when we went riding there are trees, birds, plants and lakes and some mud. But in the UAE only sand. This was my first impression! Then in May 2012 I went the first time on a desert riding tour. The beginning was like in my army time 1997, in my special motocross unit. Small hills and some small jumps through the desert like a tank has driven in before. After 20 minutes I have seen these massive sand dunes as high as a house, approx 10-15 meters. A large mountain full of sand. The fun began to rise! My desert riding experience was amazing. After 30 minutes I have the seen the first lonesome falcon flying above the top of this sand dune. We have been just alone out there in the middle of nothing, the empty quarter! Temperature has risen up to 40°C in the morning already. So we shortended the desert ride a bit due to shortage of water supplies and went back to the garage. An over one hour long ride began. I have seen camels and lots of birds flying around during my desert ride in the morning. The most amazing thing I have seen on this trip has been two small antilopes crossing my path. I tackled this dune to avoid to hit these animals with almost 80 km/h. Around 9 a.m. we have been back in the garage. I drunk 2 litres of water instantly. The last time I sweat like this was 1997 in an ABC – Combat Suit . My desert ride experience has been one of the most amazing tours in my life so far. 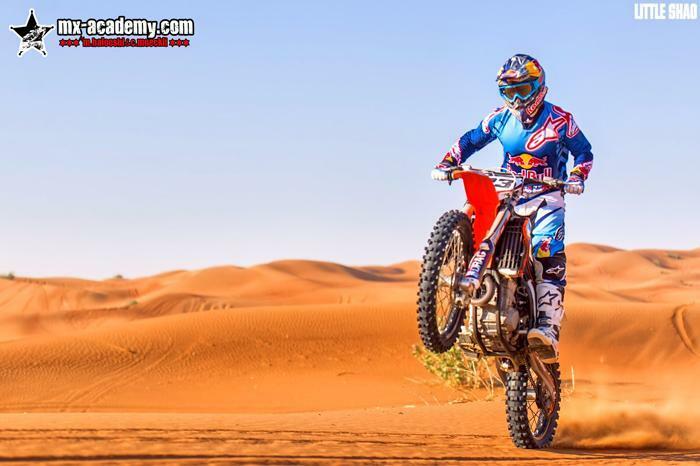 That is why I am working with Motocross Academy Dubai to offer you Mr.Mohammed Balooshi´s passion for motocross and my personal view of nature and landscape in the United Arab Emirates. If you have any questions to desert ride Dubai, just give us a call or write an email, we are looking forward to explore the desert in Dubai with you!